How Can I Determine If a Used Engine Was Built by Swedetech? How Can I Determine If My Honda CR125 is a 1999 or 2001 Build? Does SwedeTech Sell New Honda CR80 Kits? Is SwedeTech More Expensive Than Other Engine Shops? Does SwedeTech Offer Technical Support? Does SwedeTech Offer Private Test, Tune, or Track Days? Who Makes SwedeTech Branded Products? Does SwedeTech Service Used Engines? Does SwedeTech Service 4-Strokes or Street Legal Engines? Does SwedeTech Have Service Centers? How Do I Ship My Engine To SwedeTech? How Do I Ship Small Parts to Swedetech? Do I Need to Put instructions in the Box? Which Shipper Does SwedeTech Prefer? How Long Does a Package Take to Ship? What Accessories Should I Ship With My CR125 Engine? Does SwedeTech Sell and Ship Outside the United States? How Do I Check The Squish On a Two Stroke Engine? What RPM's Should I Set My Shift Lights At? Does the GFS Really Work? How Does the GFS (Gravity Feed System) Work? Can I Convert a Modified Honda to a Stock Moto Legal Engine? Does SwedeTech Sell or Support Speed Concepts Programmable Ignitions (SPI)? Keep in mind that EGT is very sensitive, which is one reason it is a good tuning aid. Many factors affect the reading or recording of your exhaust gas temperature. This distance of the EGT sensor from the face of the piston. Whether you have a fixed EGT sensor position like you would on some exhaust or a variable position if you are tuning with exhaust spacers. We typically recommend placing the sensor approximately 4.5 inches away from the exhaust side of the piston. Before you drill and weld a bung on the pipe, make sure your sensor will not interfere with either an exhaust manifold, exhaust springs, your seat, chassis, seat struts, etc. Changing exhaust components such as flex length, silencers, back pressure pills, spacers, and other common tested items will affect the EGT reading. Coatings and treatments will also affect your EGT reading. Always read your rulebook when you want to test certain items. Most associations have specifications for the exhaust system. Different fuels and different oil mixture ratios will also affect your EGT. When jetting and establishing your EGT baselines, always use the same fuel and oil that is required for the events you are testing for. Jetting is a very big factor that will affect your EGT. This is one reason many people use EGT, as proper EGT notes will help you tune your engine for peak performance. The basic idea on jetting vs EGT is, the leaner the jetting ( less fuel to air ), the hotter the EGT. The richer (fatter – more fuel to air) the jetting, the cooler the exhast gas temperature. Keep in mind, this is a very simplistic description. It is not uncommon for the engine to run lean, but have a cooler EGT. This is were your data system comes in. Once you have your engine tuned to the point that you are happy with the performance, download your data to a computer and review the EGT curves. Heat is created as the fuel ignites, too much fuel (rich condition) in the system and not all the fuel will have time to completely ignite, unable to create enough heat. The resulting left over fuel will cool your EGT. This can cause the piston or spark plug to be wet when you complete a proper plug chop. You may find that if the engine is running to lean, the EGT will actually decrease as well. Think of your fuel as energy. If you are starving your engine for fuel, it will not have the energy to create heat. Some indication that you are running to lean maybe small oil like droplets that are burned into the top of the piston, or a white or grey exhaust carbon color on the inside of your header or exhaust pipe. You will want to review your data for the optimum EGT readings that created the most power. Once you have done this a few times, you will see a pattern develop and the range your engine prefers to run. The EGT measurement is very sensitive, so you may find that you have two “identical” setups that run at different EGT. This guide is a general instruction on how to check squish on a Two Stroke Engine. First step is to determine what the squish is supposed to be. If you are using a SwedeTech Engine, we supply this number to our customers. If you are not using a SwedeTech engine, contact your engine builder for the proper squish measurement. Squish = The measurement between the piston and combustion chamber with the piston at TDC ( Top Dead Center ). This measurement is taken at the edge of the piston. For this example, let's assume the desired squish measurement is 0.040". In this example, you will use 0.050" solder. For SwedeTech Engines, we prefer to use solder that is approximately 0.010" - 0.012" thicker than the desired squish measurement. Note - Some rules such as Rotax call out in the technical specifications the required solder thickness. Always check your rules to make sure you are in compliance. Rotate crank so the piston is resting about 1/2" down from TDC. This will give you room to insert the solder as well as clearance to run the piston to TDC to squish the solder. Cut two pieces of solder a minimum of 4" in length - length of solder must be long enough to reach edge of cylinder and maintain control of solder ends from the spark plug hole. When cutting solder, use a sharp razor blade and cut perpendicular to the solder. This will leave the end of solder square. Wire cutters will leave the solder edge tapered, and this may affect your measurement. Bend the solder so the you can feed the solder through the spark plug hole, to the edge of the cylinder / piston. Now insert the second piece of solder in the opposite direction of the first. You will always want to check the squish directly above the wrist pin. With the solder butted up against the cylinder wall, rotate the crank back and forth so the piston "squishes" the solder 4-5 times. Go past TDC 0.020" -0.040" , then rotate opposite back to TDC. Remove solder from cylinder and measure the thinnest part of the solder with a set of calipers that have been zeroed out. This can be a few 1/1000ths from the end of the solder. Using base gaskets or head gaskets, move the cylinder or head in the direction of desired squish measurement. Repeat above steps until desired squish is found. Note - If squish measurement from left solder to right solder differ, you may need to move the head around to achieve equal squish on both sides. Make sure the nuts or bolts for the cylinder and head are torqued evenly to the proper specifications. Every engine package is going to require different shift points. And many times, you may change shift points based on the circuit layout. Another factor will be how fast your data acquisition unit can read, record, and activate the shift lights. For example, if an engine has an optimal shift point of 13,000 rpm's, you may want to set the shift light at 12,500 rpm's in order to give the unit and your mind time to react at the proper shift point. We receive this question on a very regular basis. The cost difference of an ICC or KZ package versus the Honda CR125 Stock Moto. We wrote and article that we broke into two parts. Please give us your feedback on the articles. We want to make sure we provide information that is helpful to you. Yes. SwedeTech services used 2-stroke engines in need of a freshen up rebuild, top end rebuild, or porting and maching updates. See our list of services offered by our shop. If you do not see your engine listed on our website, please send us a detailed email regarding the services you are looking for. Include the make, model, year, racing association, and all important information regarding your engine package and requirements. A majority of our business comes from rebuilding and servicing used or existing two-stroke racing engines. This includes used engines purchased from a private party, another engine builders package, and engines with unknown history. No. At this time, SwedeTech is not accepting work or offering services for 4-stroke type engines, including motorcycles, ATV’s, or automobiles. If you are not sure if your engine is a four stroke or two stroke, you can find resources online or send us a detailed email. No, we do not have authorized or dedicated service centers for SwedeTech engines or components. To keep your engine up to current SwedeTech specifications, it must be serviced or rebuilt directly by SwedeTech in regular intervals. Our only service location is located in Wilton, CA. Although we do not have service centers, for basic routine maintenance, the SwedeTech staff can recommend a closer shop that is familiar with our products and requirements. Please send us an email detailing the services you are looking for and if it will require the professional services offered by SwedeTech. Yes! SwedeTech does not make it a habit to take customers hard earned money without providing results, superior performance, and reliability. There are other solutions that are cheaper, and are perfectly suitable for getting an engine running around the track. For those not looking for every racing advantage, the other systems are adequate, and in many cases, cheaper. If SwedeTech puts our name on a branded product, you can be sure that the product has been thourougly tested in our dyno room, track tests, and national level race events. The GFS was designed using unmodified Keihin PWM and PWK carburetors on the Honda CR125 engine adapted for kart racing use. To explain how the whole system works, you need to break it down into two components. The top reservoir mounted above the carburetor is the supply reservoir. 1 fuel pump keeps this reservoir filled at all times. The fuel flowing to the carburetor is not pressurized, but is gravity flowed so the carburetor can work in the manner it was designed, for a motorcycle, with a gas tank and not a fuel pump. The lower reservoir works independently, and its purpose is to capture all the excessive fuel from the vent lines and float bowl over flow, which in a karting application, has excessive overflow. The reservoir captures the fuel and 1 fuel pump returns this excessive fuel back to the karts fuel tank. To summarize, the top can is a mini gas tank supplied by a fuel pump. The lower can is a capture can and returns all excessive fuel back to the karts gas tank. If you purchase the GFS directly from Swedetech, we will include everything needed for a proper installation on a Honda CR125 engine adapted for kart racing use. The Gravity Feed System includes a fuel pump mounting plates, two fuel pumps, pulse line assembly, upper and lower canisters, pre-plumbed, and all mounting hardware. The OE 1999 Honda CR125 CDI module and rubber sleeve slip fit directly to the top of the fuel pump bracket plate. The GFS does not include the carburetor, the OE 1999 Honda CR125 CDI module, or the rubber CDI sleeve. When purchased directly from SwedeTech, we will also include a detailed installation sheet. If you are purchasing a used GFS system, we offer an overhaul service to inspect the fuel pumps, upper and lower canisters, fuel lines, and carburetor. Parts and Labor are additional charges for used rebuild services. We do not offer over the phone technical support for used GFS systems that were not purchased directly from SwedeTech. If you are buying a new or used engine from either a professional shop or a private party, always ask for the build sheet information. If the seller is unable to supply you with this information, you may want to choose to purchase your equipment from another source. This FAQ article was written with the Honda CR125 Stock Moto classes in mind, built under the rule structure supplied by SKUSA, or SuperKartsUsa. When a Honda CR125 engine is properly built for shifter kart use, there are many factors that go into the final build. One of the biggest options is the use of the Early Model or Late Model cylinders. The early model cylinders include production dates from 1997 to 1999, commonly referred to as the 1999 cylinder. The late model cylinders include production dates from 2000 to 2002, commonly referred to as the 2001 cylinder. There are tell tale signs from the outside to determine which cylinder you may have. If you are looking at buying an engine for racing purposes, always read the proper rules and regulations for the sanctioning body in which you will particpate in. This article is not intended to itemize all items you can and can't do with a Honda engine, but only a short guide to tell the difference in the cylinder years. Below you will find a photo album which will have comparitive photos. For a SwedeTech Stock Honda engine pacakge, we recommend the use of VP C12. If this option is not available or legal for your racing series, we would recommend the product that is most comparable. Lower octane may require richer jetting. It will also increase the chance of engine failure and detonation due to the karting use of the Honda CR125 engine. Pump fuel is not acceptable and will cause engine damage. We never recommend fuel additives or oxygenated fuels for the Stock Moto Honda application. Yes, you can do anything. However, many times it is not cost effective to convert a Modified or Blueprinted Honda CR125 over to a Stock Honda or Stock Moto class. To convert a SwedeTech modified engine to a Stock Honda, you will need to purchase stock cases, oem CDI box, stock cylinder, stock head, and stock intake manifold and reed cage assembly, and a spec exhaust system such as the RLV R4 or SKUSA SK1 exhuast pipe. You may also need to purchase a new transmission if the modified engine had a transmission that was processed by a friction reduction process. If the carburetor was modified or bored out, you will also need to purchase a stock OEM Keihin carburetor. Yes, we do ship internationally. In some countries, we have Authorized Distributors which promote and sell the SwedeTech product line. However, distributors are not service centers, they are in place to supply SwedeTech products only. To maintain the integrity of your SwedeTech engine, it must be serviced directly by the professional staff at SwedeTech Racing Engines in Wilton, CA. For countries in which we deal directly with the end user, we will accept payment in the form of a wire transfer or PayPal. In all cases, we require funds to clear our bank before the item(s) are packaged and shipped. All SwedeTech Racing Products are made in the USA. All SwedeTech Racing Products are designed in our Sacramento area facility. However, we have numerous parts that are outsourced to full time machine shops or productions facilities. All of these facilities are located in the United States. We do not outsource our designs or production to foreign companies, not even Sweden. We are proud of American Made Quality and support our fellow Americans. Yes, we still program Speed Concepts SPI boxes, but we do not offer programming services for other brands such as the Wolf Box, MSD, or Vortex ignitions. No, we no longer sell a progammable ignition for the Honda CR125 engine. Speed Concepts has discontinued the SPI product line. At this time, we do not have a recommendation for a replacement unit. SwedeTech Racing Engines recommends shipping your engine to us using either UPS or FedEx services. Using other shippers may result in delayed delivery to our shop location. Please print two copies of the Shipping Form. Shipping Form opens in a new browser window. Fill out both shipping forms completely. Incomplete forms will result in delayed work order processing. If you have the ability to scan or fax the form, you can do this in addition to placing one copy on the inside of the box, and one copy on the outside of the box in an envelope. Always empty all fluids (water, oil, fuel, etc) from the engine and accessories. If your shipment starts to leak or stains appear on the outside of the box, the shipping carriers will delay processing or refuse delivery. If there is a chance for residual fluids to leak, wrap the engine in a plastic bag. Swedetech recommends double boxing your engine. More information can be found on our YouTube page. Proper packaging and shipping will save you time and money. SwedeTech Racing is not responsible or liable for inbound packages that were not packaged correctly. SwedeTech Racing Engines recommends shipping your small parts or engine accessories to us using either UPS or FedEx services. Using other shippers may result in delayed delivery to our shop location. Please print two copies of the Shipping Form. Shipping Form will open in a new browswer window. If there is a chance for residual fluids to leak, wrap the engine parts or accessories in a plastic bag. Swedetech recommends double boxing parts and accessories. Keep in mind that the shippers wharehouses have conveyor belts that are 36" - 40" off the ground. After packaging, your contents must be able to fall this distance without damage. Yes! - Regardless if you spoke to a Swedetech employee or not, always place detailed instructions inside the package. Failure to include contact information and work order description will result in delayed turn around times. You can include one copy inside the packaging and you can email another copy directly to our shop. Once the box is received, we will notify you by email or a phone call. Please note if your package is damaged upon arrival at our shop, we may still sign for the package and have the carrier document the external box damage. We do this to avoid further damage by carrier if we were to reject the package. SwedeTech Racing receives drop offs and deliveries from FedEx, UPS, and USPS on a daily basis, excluding weekends. From our 20+ years of engine building and shipping experience, we have found the best overall shipping service with FedEx. SwedeTech has regular daily Ground and Home Delivery pick up services. For Express Shipments, SwedeTech must schedule a pick up service before 11:00 AM PST. Swedetech has started to utilize the United States Post Service (USPS) for small flat rate type packages. Due to our location and mail delivery time, all USPS boxes are shipped the following business day. Aside from FedEx, if you prefer another shipping vendor, we are happy to fulfill your request. However, you will be required to provide the shipping label for your package. We will make every effort to supply you with accurate box dimensions and weight. SwedeTech will not be responsible for scheduling non FedEx pickups. This may result in delayed shipping. Depending on the current workload in our shop and product availability, SwedeTech Racing makes an effort to ship your order within 1 business day. For special orders or engine service, customer will be notified about approximate ship dates and delivery time frames. From the SwedeTech shop in Wilton, FedEx offers next day ground delivery to the following zip codes. FedEx Ground offers Ground and Home Delivery shipping options across the United States. The map below is estimated shipping days from the Swedetech shop to your destination. For expidited shipping, please choose an Express Service such as Next Day, 2nd Day, or Saver (3-day). Express orders will be processed in the order received before we process the Ground or USPS orders. We will make every effort to ship express packages the same day if the order is received by 12:00 PM PST (Pacific Standard Time - Los Angeles - San Francisco). Due to our rural location, all Express Shipments must be scheduled and confirmed no later than 12:00 PM (PST). 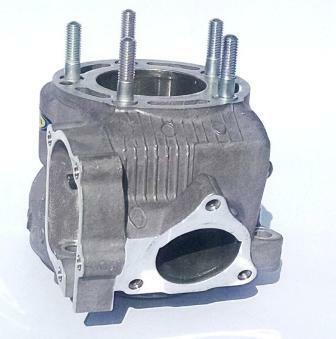 Accessories that you should send for your CR125 will depend on the service and repair required for the CR125 engine. For a standard refresh or rebuild, our technicians would like the engine, complete ignition system (stator, flywheel, coil, and cdi), carburetor, fuel pump(s), fuel system, intake and reedcage assembly, exhaust manifold, and J-arm (in your original position). Generally, we do not require the exhaust pipe, silencer/muffler, exhaust brackets, engine mount, airbox/air filter, chain, clutch cable, throttle cable, and old fuel lines. If you are sending your Honda CR125 engine to our shop for troubleshooting, please call or email in advanced. While your engine is in our shop, this is a good time to inspect your remaining accessories for damage, fatigue, or wear. Replace your fuel lines, fuel filter, and cables. Repack your silencer. Inspect your exhaust pipe for damage or failure. Clean your fuel tank and floor pan. Clean and inspect your chassis for cracks or fatigue. Replace your chain and inspect all sprockets. Most of these parts can be found on the only official Online Shopping Cart for SwedeTech, www.shopswedetech.com. If you are unable to find a part, please contact our office. Yes. SwedeTech offers USPS, United States Postal Service, services for small items and documents. If a customer chooses to use USPS services, SwedeTech Racing will not assume liabilty for claims, delays, damage, discounts, or refunds. SwedeTech will not ship large or valuable items via USPS. Due to the rural location of the SwedeTech shop, USPS orders will be processed and shipped within 2 days of receiving the order. If you have a shipper account number for another carrier other than Fed EX, SwedeTech will properly package, measure, and weigh your shipping contents so you can schedule the package pick up from our location. Fed Ex Ground and Home delivery pick up from our location Monday - Friday. Fed Ex Express must be scheduled each day before 12:00 PM PST for same day pick up. USPS items will be placed in mailbox or post office 1-2 business from receipt of order. UPS and all other carriers have drop off service at our location when we have inbound packages. Other than FED EX, no other carriers have a daily pick up at our location. We receive this question all the time. Always remember, BUYER BEWARE!. The only way to determine with 100% certainty is to have the engine or components physcially inspected by SwedeTech Racing. We do not have service center locations, so it would need to be shipped to our Wilton, CA facility. Other steps you can take to gain information on the engine is to ask the seller for receipts, data logs, and track notes. You will also want to ask the seller the last time it was shipped to SwedeTech for a service. You can ask the seller to remove the cylinder and show you pictures of the condition of the top end components. If the engine is part of a turn key karting package, ask the seller to send you a video of the engine running. In many cases, SwedeTech will stamp the engines with a serial number. However, this does not mean we were the last ones to service the engine. If the engine was originally purchased from SwedeTech, but rebuilt or serviced by another entity or individual, we will still need to inspect the engine to determine if it still meets SwedeTech's stringent standards. On the Honda CR125 engines, the SwedeTech serial number will be stamped on the left case half (Ignition Side) on the raised portion in which the clutch cable goes through the case. For ICC engines, the SwedeTech serial number will usually be stamped near the location of the CIK or OEM serial number or homologation number. The serial number will usually have either 5 numerals or 9 numerals, but once again, the serial only indicates the original build. Ask the seller for all receipts and service history. Some of the older modified engines such as the modified Honda CR125 or all the ICC / KZ engines will have crowns stamped on the cylinders. A single crown designates that the engine was built to a regional or stage 1 specification. A double crown designates that the engine was built to a national level or stage 2 specification. For the Stock Moto engine packages, we do not use the crown stampings, since all of them are built for maximum performance. The serial number on the engine will only indicate the original build on an engine. It will not give us the running or maintenance history. Again, ask the seller for receipts and notes on the engine purchase. This will not ensure that it is a true SwedeTech, however, it is a huge leap in the right direction. NEVER buy an engine or component because it has a SwedeTech sticker. We give these away for free to anyone. You must do your due diligence when purchasing a used item. Make sure the seller will offer a full refund if the engine is not a genuine SwedeTech package. Another huge red flag is to ask the seller to ship the engine to SwedeTech for a full inspection. If they are unwilling to do so, find out why. Great question and a common concern among engine customers. None of us want to pay more than we have to for any service or product, afterall, we work hard for our disposable incomes. When it comes to the service side, SwedeTech has an industry wide, well known reputation for customer service, trackside support, and engine tuning knowledge. The amount of time, money, and resources spent finding that added advantage for our engine customers comes at a cost. Trackside testing, quality dyno equipment, quality machine shop tools, and quality measurement tools come at higher costs. In order to keep the doors open, this cost must be spread out over parts sales, service and labor costs, and other income generating streams. So the real question you should ask yourself is, does SwedeTech provide enough VALUE to my racing program. You may or may not need a horsepower advantage or our trackside support for your program. We understand saving a little money here and there is the difference between racing and possibly sitting at home. Is the technical staff easily available to answer my questions? Is the information prompt and accurate? Will this karting business be at the track or events that I participate in? Does this karting business bring parts and supplies to each event? Does this karting business have the parts in stock to quickly meet my needs? While at the track, is this business availble to assist me with my racing program? What is the overall reputation of this business? How can this business add value to my racing program? Yes. SwedeTech offers technical support to our engine customer in many forms. SwedeTech is most recognized for our track side support at local, regional, and national races. We offer private test days and private event support as well. When we are not at the track supporting our customers, we offer technical support via email and phone calls, Monday through Friday. Due to the large call and email volume and increasing technical request demands, we must prioritize our technical support. Current and active direct engine customers will receive priority service. Current and active direct engine customers are defined as those customers that are actively purchasing new or used products and services directly through our shop and are established in our database. The next level of service priority will go to engine customers who have purchased new SwedeTech products through our dealer network (not directly from SwedeTech, but authorized dealers). The final level of service priority will go to engine customers who have purchased new or used equipment or parts from unauthorized dealers or private parties such as Ebay, craigslist, and/or other online classifieds. Some items such as a used carburetor, fuel system, or used engines with unknown history will not receive phone or email technical service. However, in these rare instances, we offer labor service and the opportunity for you to send the parts or equipment to our shop for a proper evaluation. SwedeTech Racing Engines does not offer technical support for chassis related items. Although we are staffed with technicians that have a combined 70+ years of racing experience, our focus is 2-stroke racing engines. Yes! We understand that many of our SwedeTech customers are looking for an added advantage over the competition, which is usually one of the reasons a racer chooses SwedeTech Racing Engines. We also know that we may not have a particual series or event on our race support calendar due to many factors including race schedule conflicts and general customer participation. This does not mean an event is not important to you. There are a number of weekends throughout the year in which a SwedeTech staff member is available on a for hire basis. For more information on your specific needs, please contact our front office.